I consider myself a balanced dog trainer so I use a balance of reinforcement and corrections when teaching a dog commands and lifestyle choices. My toolbox is really large (it is actually a big heavy pelican case). I carry a variety of treats, leashes, long lines, martingale collars, prong collars, starmark collars, clickers, muzzles, essential oils, e-collars, harnesses, spray bottle, pet convincer, shaker can and doggie don’t. During a private lesson or group class I may demonstrate or use one or all of those items. 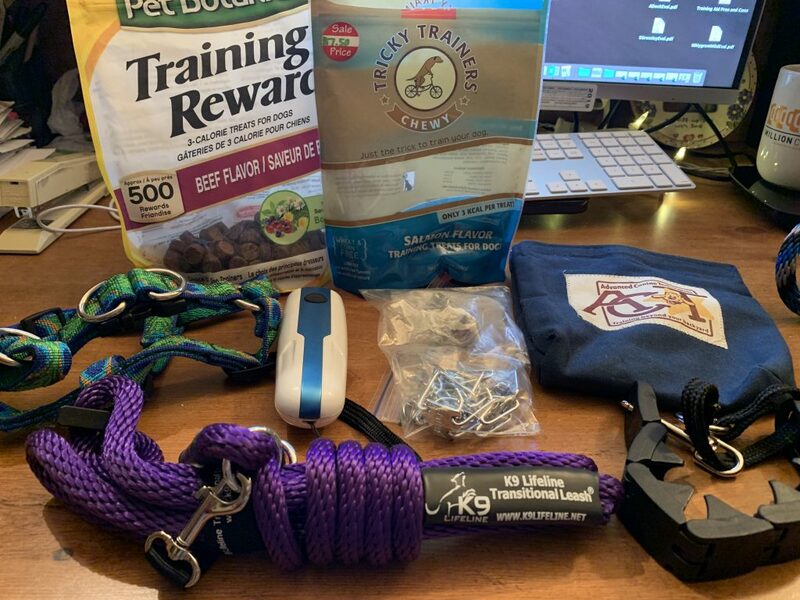 No matter what training aid you choose to use, my goal is to help you fit it correctly and help you to acclimate the training aid to your dog. Whether you use a gentle leader or Halti, transitional leash, flat collar, pinch collar, harness or e-collar, I want to make sure the aid is correctly fitted on your dog and instruct you how to help your dog acclimate to it over time. What works for one dog may not work for another dog. I encourage everyone to keep an open mind about training aids and allow us to demonstrate to see which one works the best for you and your dog as a team. If you are not comfortable with a certain aid, we respect that and will find a tool that works the best for you and your dog. Contrary to belief, any training aid can cause pain if used or fitted incorrectly. Too many treats can cause weight gain and less value on you if you don’t have a treat. If a gentle leader or Halti isn’t fitted correctly or if the dog is given a harsh tug on the leash, it can hurt the dog’s neck or leave marks on the dog’s face. Harnesses can cause gait issues if they aren’t fitted correctly and pull to the left or right of the dog’s front legs or they can leave sores under the armpits if fitted incorrectly. The same can be said for pinch or e-collars. If you click and don’t reward the dog, then the absence of a treat can be harmful to the dog as well. My hope is to help you and your dog develop a great working relationship. In order to do that, your dog needs to see you as a teammate and someone that will have their back. You need to provide them guidance and direction and give them constant feedback, both positive and constructive! You can be your dog’s best friend and their leader BUT you need to make the rules fair and consistent. If you do that, your dog will look to you for direction and guidance. I would love to hear from all of you on what training aid has made the biggest impact for you and why.